It’s always an exciting time both entering the Port de l’Arsenal marina, coming home for winter, and then again when leaving for the season’s travels. This time was no exception; we had many hands helping with ropes to move our neighbour‘s boat which was rafted to our side. Sasha (one of the wonderful team from the Harbourmaster’s Office) had the lock ready. There was a bustle of activity all around us on shore whilst we headed the short distance into the lock. 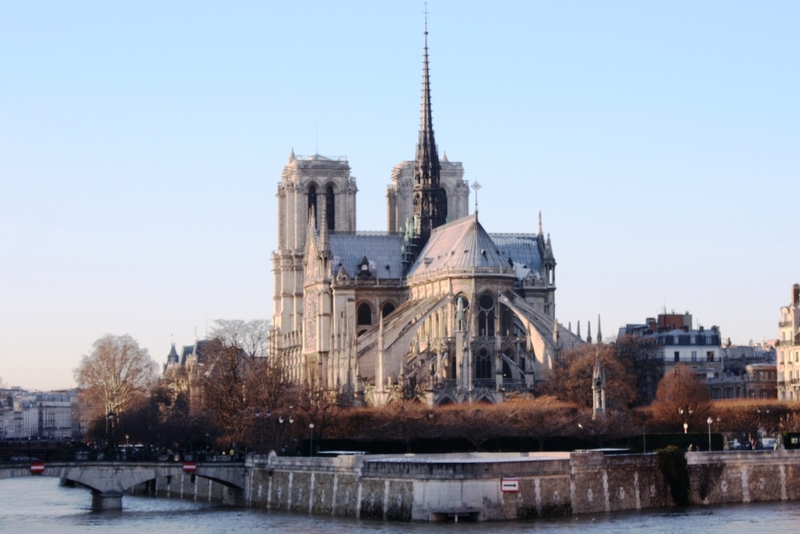 Friends and tourists alike followed our progress as the lock drained and within no time they were waving goodbye as we roared out into the fast-flowing River Seine and headed upriver. Turning upriver from the lock at Port de l’Arsenal we leave Notre Dame behind. Heading up the river it looked bleak and it was certainly cold.. and lonely after Paris. That was almost two weeks ago now. 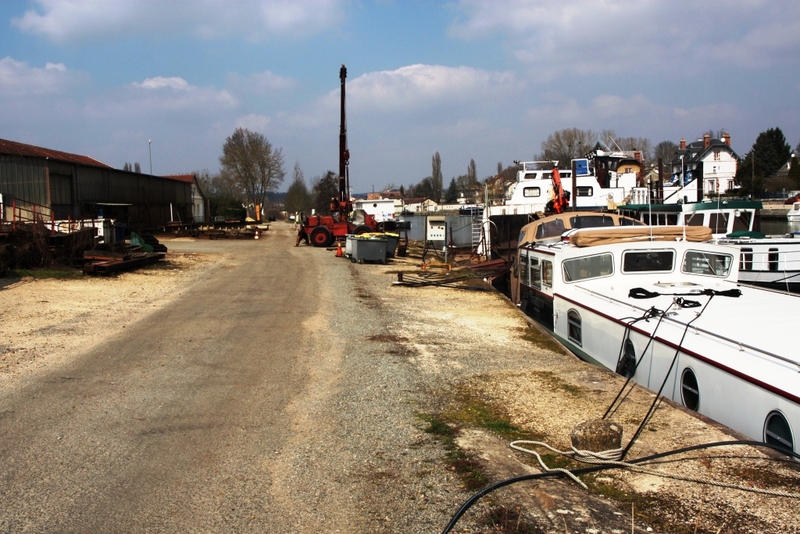 We would have liked to stay in Paris for Easter but to be on schedule for our appointment with the boatyard, Rousseaus at Moret-sur-Loing, we had to press on. Because of the strong flow our average speed didn’t get much above five kilometres per hour and that was with relatively high revs therefore consuming a heap of fuel. 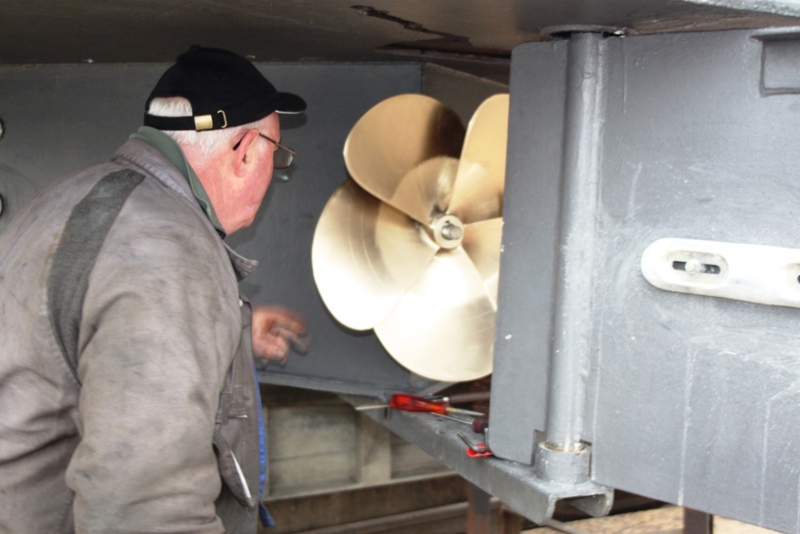 We’d planned to get our tanks low for the lift onto dry land (to replace our propeller and fix our water intake fittings for cooling the engine), and we certainly achieved it. We consumed almost a full tank of fuel, in the less than three days journey, and were in the red on arrival – knowing the fuel depot was only a few kilometres away from the boatyard. 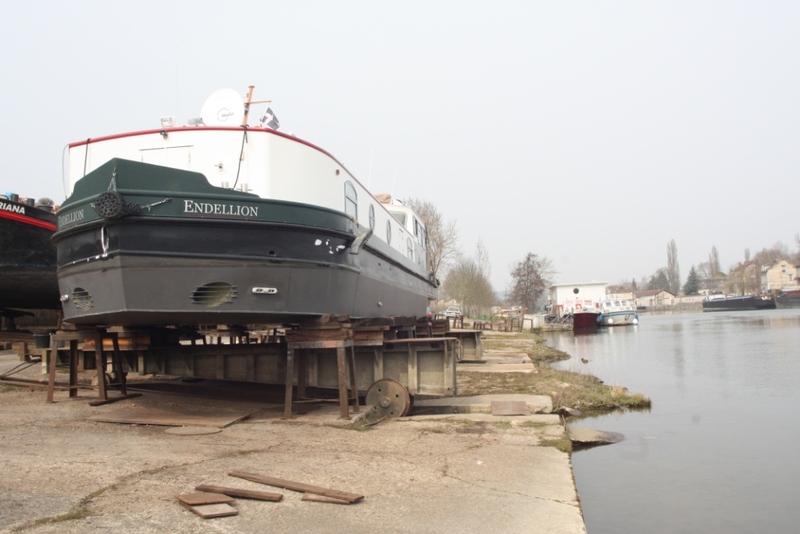 Endellion moored on the banks at the Rousseau boatyard .. waiting. So with such a flurry of activity on our side, it was more than disappointing to find that the ‘schedule’ we’d been working to (based on our meeting with Rousseaus in April and follow-up emails) seemed to be non-existent. No, we won’t be working on your boat today (Wednesday).. perhaps on Monday, we were told. But that’s Easter Monday are you open then, I asked. Oh, no – forgot it’s a holiday. So Tuesday! Stewart studying the Alfred Sisley painting and then the scene he painted in 1891. 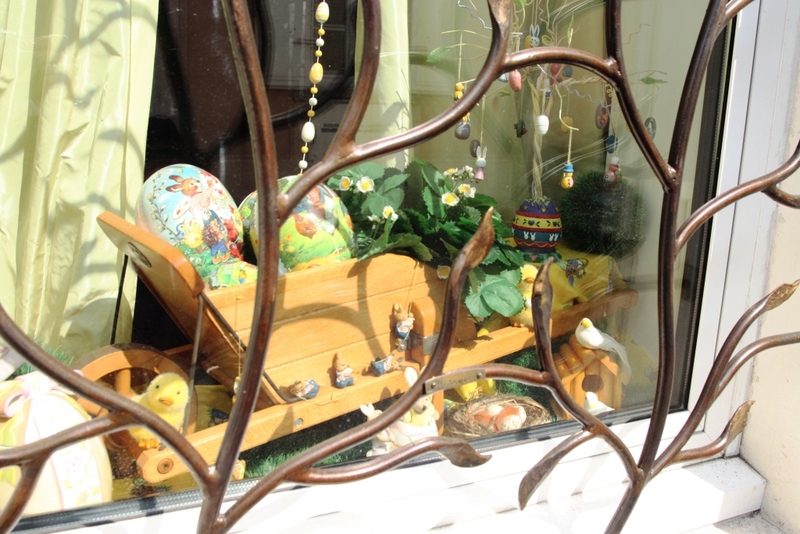 A delightful Easter themed window dressing in the village of Moret. We spent our Easter with such a tiny amount of fuel sitting in the boatyard, waiting. We took a few tours around the lovely town of Moret, but unfortunately most of it is not accessible (the Sisley museum, the Tourist Office exhibition, the Barley Sugar shop) and it was still bitterly cold. We were more than ready for action when Tuesday finally came around. Sadly, this was not on the agenda although, luckily, the electricians (through Rousseaus) did arrive and connected our solar panels (fitted in Paris by Gael) and worked on a few other electrical jobs. Rousseaus were busy and couldn’t do anything until Wednesday when they at last planned to lift us, after a week of waiting. 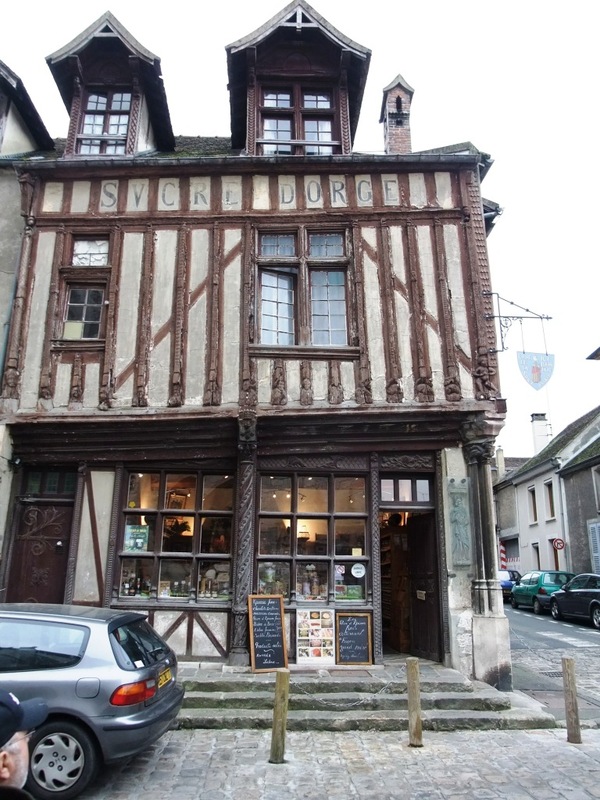 The Moret barley sugar shop established in 1638. Endellion finally up on land, sitting on top of the ‘chariots’. Sure enough they lifted us, with some difficulty. Here at Rousseaus they use an inclined plane to slide you out of the water on ‘chariots’ (as they call them) on wheels which you position the boat over and they winch boat and chariots up and out. That’s the theory. In practice, for us anyway, the chariots were sitting a little bit high in the water so to get on top of them Stewart had to use all the engine power we had, despite being told, whatever you do, go really, really slowly. Finally we made it and we were sitting on dry land ready for action. One of the two ‘chariots’ which is plunged deep into the water for the boat to sit on. Well .. “we’re very busy” we were told again. We had to remind them Stewart couldn’t get off the boat sitting up there on dry land, and thankfully that seemed to spark action. With all of Thursday sitting waiting, Friday was a great relief to have the brilliant Dominic (two years ago we he was the mechanic who fixed our fuel problems) and colleagues who made light work of fitting our amazing, Michigan five-blade propeller (see Stewart’s detail below), the new anchor, and modifying the water intake for cooling the engine (see our blog coming into Paris when leaves blocked the system). Dominic tows Endellion off the ‘chariots’ and into deep enough water to float away. That was on Friday and good to their word they had us back in the water by late afternoon. However, if we had problems getting up onto the chariots to be lifted, we had much bigger problems trying to get off as they weren’t low enough in the water – so we just sat there. In the end it was Dominic who came to the rescue with his fork-lift truck. It needed a heavy-duty rope and then a pull in the right direction to finally drag us off to safely float away. Why did we feel we needed a new propeller (and go through the cost and upheaval of being lifted once again) when we had a new motor with a perfectly good prop? Our new motor is just over two times the horse power of the old one; 144 compared to 70. This means it has the power to turn the prop almost twice as fast as before. The funny noise and vibrations which we used to hear from around 1000 revs a minute were so loud at just 2200 revs that conversation had been more like an argument! 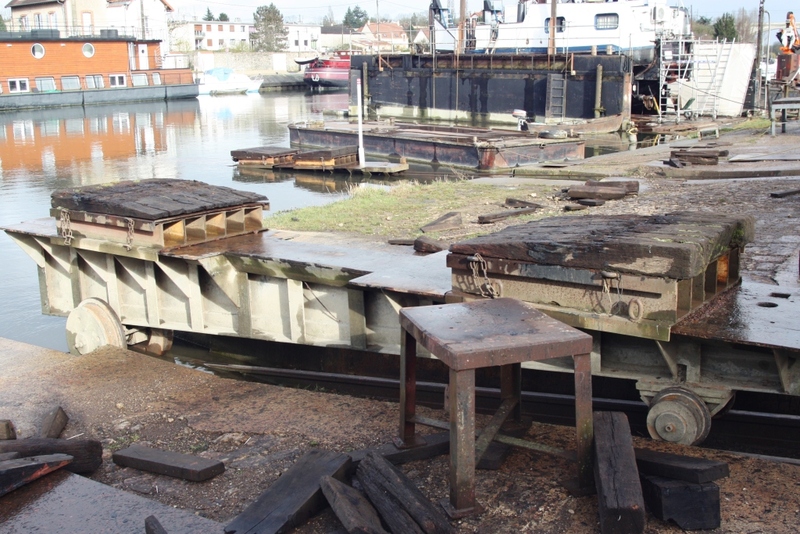 By 2500 the engine covers on the rear deck were rattling around making it even worse. 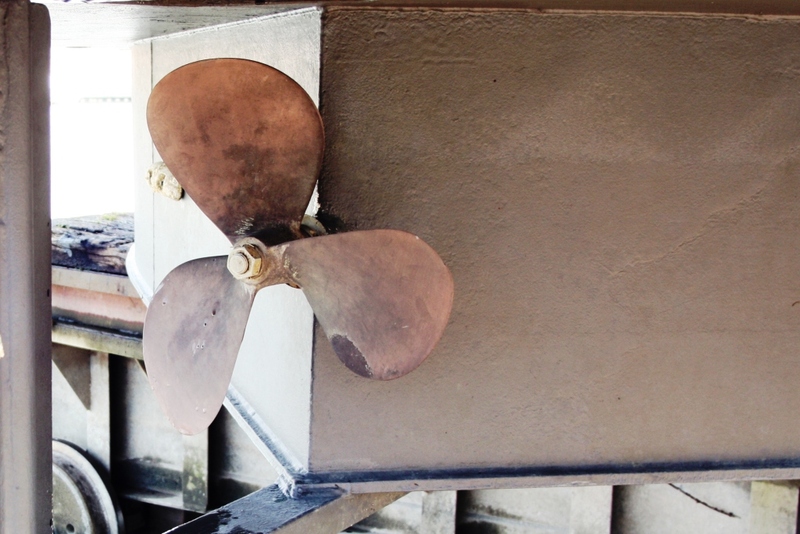 The old (original) three-blade propeller. 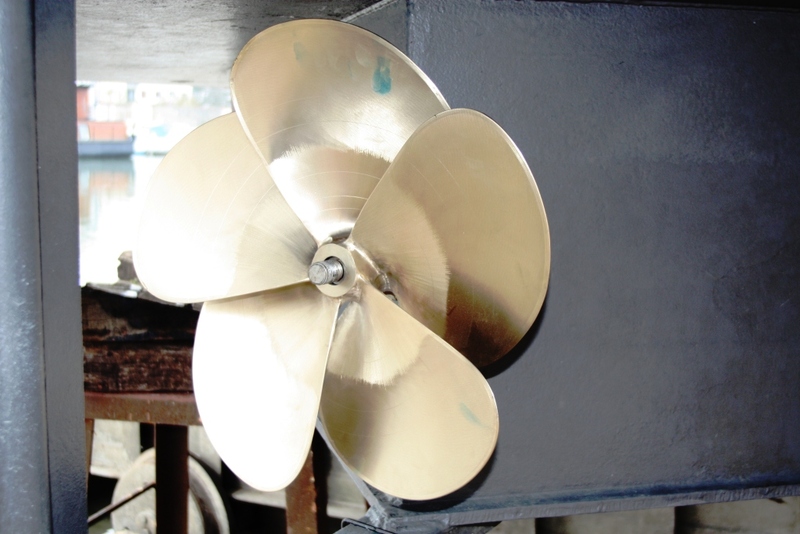 This was all happening due to what engineers call propeller cavitation. The problem lay with our three-blade prop and its sharply pitched blades hiding behind Endellion’s fat stern. That meant the area of the blades equated to only 50% of the total area of the prop circle. The new Steyr had the old prop turning so fast it was unable to get enough water and had been sucking in air like a milkshake mixer. Propellers experts Michigan Wheel in the USA, who’d been making props since 1900, confirmed what other experts had told us. We needed more blades on our prop so we didn’t need so much pitch. Our friend Peter Nott on Phoenician had said back in Paris that we should go the full hog and go for a five-blade prop, which would mean that the blades would fill the whole prop circle. “You won’t believe the difference,” Peter (once a crop duster pilot, so he should know about propellers), had predicted. Dominic is impressed with the new prop. It turned out he was spot on. It’s a vastly different experience now. There’s no more cavitation so she’s quieter, faster and she drinks considerably less fuel. 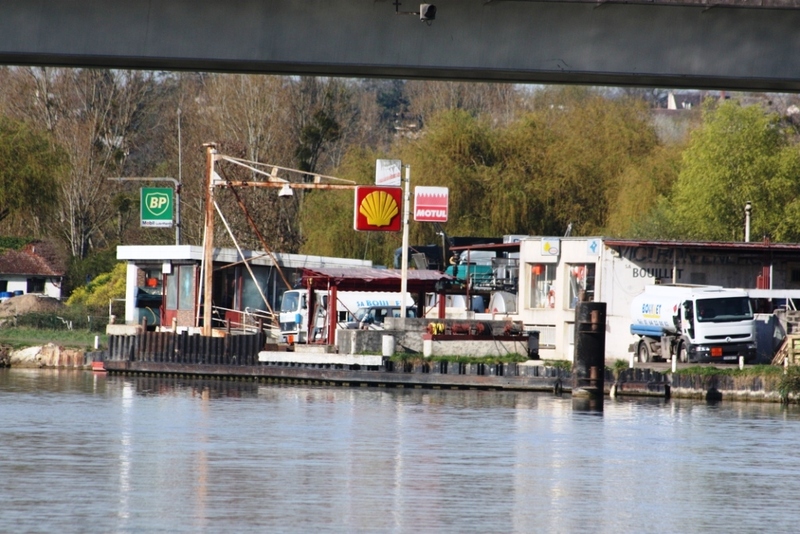 The run-down fuel depot at St Mammes, who won’t sell red diesel to pleasure boats. 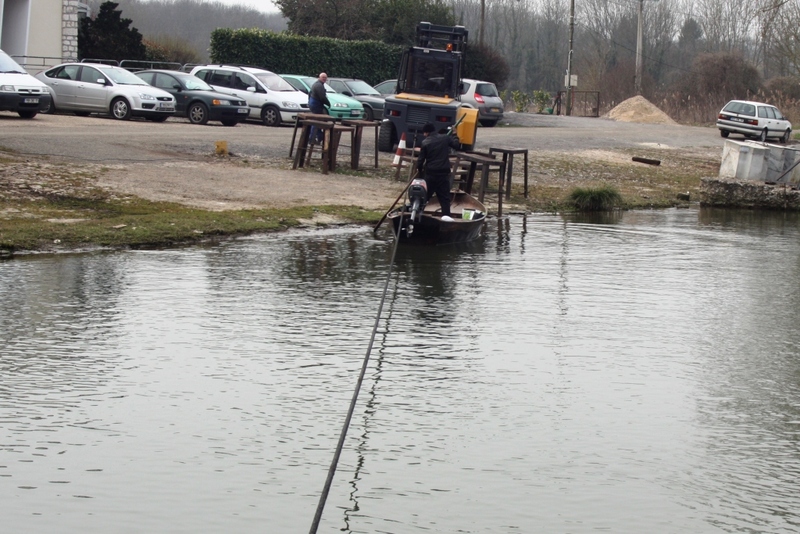 To give Endellion’s new prop a good test run we headed down the Loing a kilometre or so to the Seine and across to the fuel depot to fill our tanks. That’s another story, with our luck we found we drained their diesel bowser (which could mean black sludge in our fuel system) but did take on enough to fill two of our three tanks which should keep us going for a while. 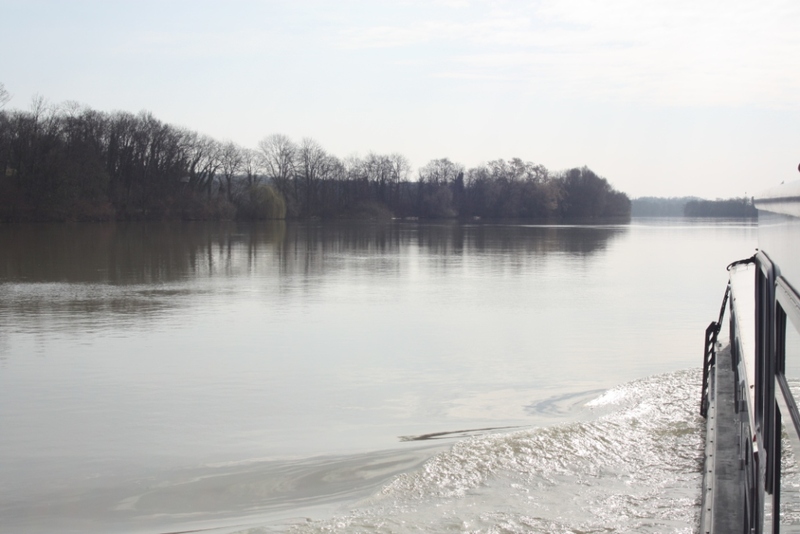 With huge excitement over the “new” Endellion, we gave her another run down the Seine at full revs and were delighted. 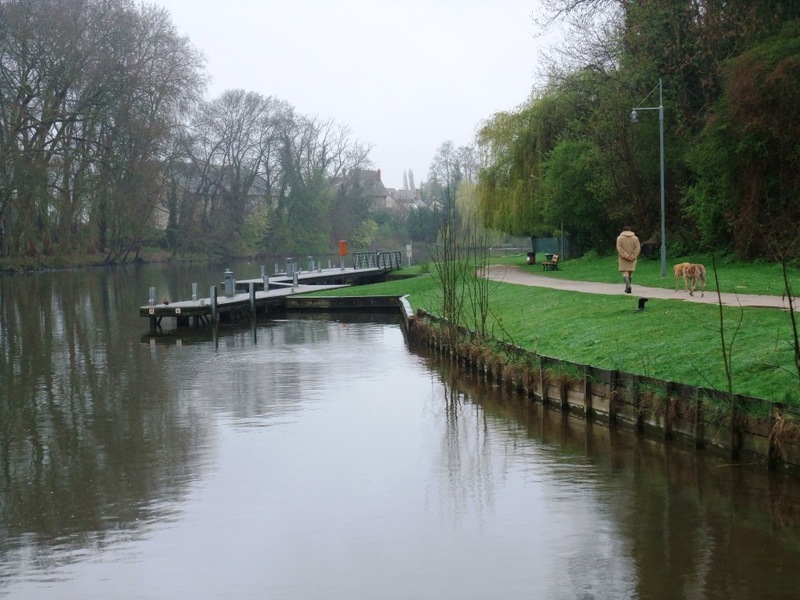 We can’t wait to head off to enjoy a whole new barging experience! Lovely, quiet moorings at Moret-sur-Loing. We spent the weekend in Moret at the small and quiet pleasure boat mooring closer to town and away from the working boat yard. We’re now back at Rousseaus to tick off some more small jobs on our list before we head off south towards Roanne. The rain has arrived, the freezing and frosty mornings are on hold and hopefully, at last, we can enjoy spring with summer on its way. 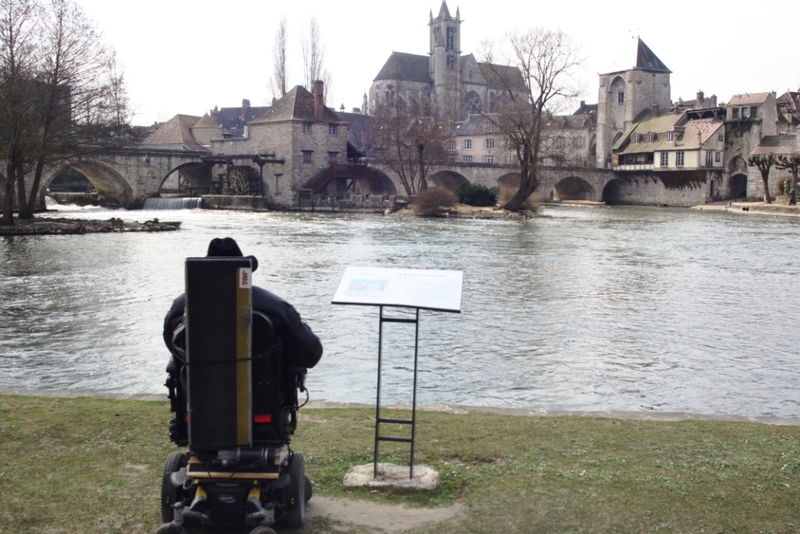 This entry was posted in Accessibility, Waterway life, Waterway services and tagged Boat services, Endellion barge, Paris, Ship repairs, Travel, Waterway services, Wheelchair access. Bookmark the permalink. Quieter, faster, more fuel efficient, and nice to look at too, seems like you made the right decision. I’m sorry about your being waylaid in Moret and am looking forward to reading about your adventures in the Rs. A very interesting prop. I can just imagine your excitement with all the newfound power and efficiency.